Aliveblog of Mary Poppendieck’s xp2016 keynote. Back to the chasm, where agile was in 2004. What is in the chasm now? How Conway’s law brought us two the cloud. Amazon two pizza teams: scale with less communication by giving up immediate consistency, but going for eventual consistency instead. Automomous teams that handle their own deployments. This is something new Amazon could sell. “Creators need a direct connection with what they are creating” - Brett Vincent (Willem - see also Doug Engelbart). Mary and Tom have a principle too: teams need an immediate connection with what they are creating. E.g. continuous deployment. Focus on problems not features. The engineering team works on the problem, not features. Plan with hypotheses, not estimates. What is the hypothesis? What are three hypotheses? Run several experiments. Most will be wrong. If they are not wrong, we are not doing good experiments. Only half of what product managers guess would be a good idea is actually a good idea. 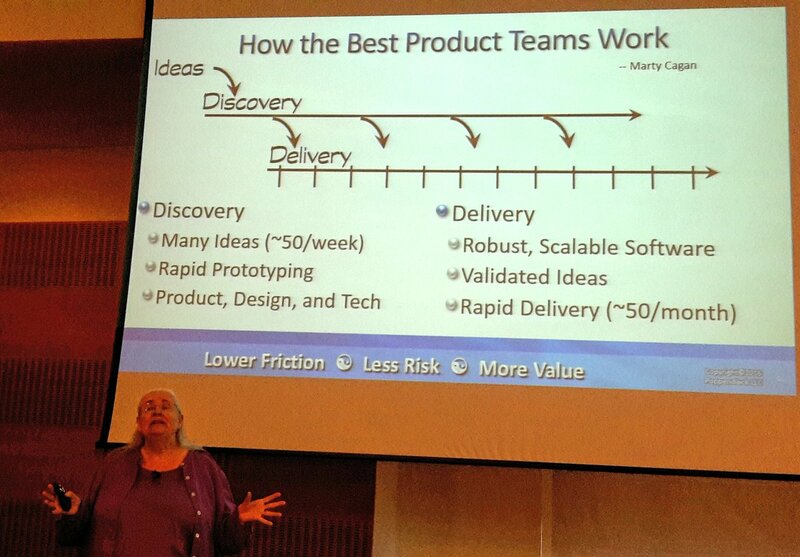 Almost half of product ideas are wrong (by product managers), technical people should also add things to develop. A funnel that looks something like this (visual in the slide is better). Test automation is like double entry bookkeeping. The goal is to find integration issues as soon as possible.Production code and tests are two automated views on the same thing. (Willem: so are solid types). “You know you are doing structured programmin when you don’t have integration problems”. (I didn’t get the source). Federation is the way to scale. Google search: federation, let it fail. Lucene tried to follow along, struggled and finally the team gleaned HDFS and MapReduce from googles’ papers. Story about Gripen fighter, focusing on lower operational and design costs over 50+ years with each new generation. Now much cheaper than F-16 (let alone JSF). Federation is essential to keep costs down. How do I create an architecture where things are not integrated, but federated. Integrated Federated Architecture. The planes are like a smartphone platform - trade out any component without effecting flight worthiness and certification. Every single piece can be developed in isolation. Three week iterations, synchronize across hard and software every quarter. Every year higher level plan for the next year. They integrate every week, even though iterations are three weeks. Hardware simulators allow more frequent integration. Feedback cycle is fundamental to not let badd stuff be built on top of bad stuff. Some examples of platforms. Then: Smart platforms. Tractors are completely automated. Any equipment you have can be added onto a John Deere Tractor, and at night you can use the data from the tractor platform to make sense of your farming business. “Products have features, but platforms create communities”. Marshall van Asltyne book: Platforms scale. A platform will beat a pipeline product. The main problem is to get the network effect. The thing scales all by itself with very little effort. Open banking in the EU. Open APIs to all bank acccounts (XS2A). A platform that shows all your bank accounts can be made by anyone. A trusted vendor should be able to move money between all your accounts. Drop fees with currency transanctions. Currency transactions are funding other bank stuff. Financial platforms are coming, it will be interesting to see how they survive and where they are coming. Google deep learning platform. Bots are coming of age, self-driving cars, soil fertilizing drones. What does it take to engineer a good platform? Good weather does not make good sailorss. Fragile -> Robust -> Anti-fragile. If you take a look at the really robust systems today - they are not trying to be robust, but anti-fragile. Fragile systems built up hidden risk and catastrophic failure. Wherever you suppress volatility artificially, risk will build up invisibly, catastrophic failure will happen (e.g. stock markets). Allow the crash to not spread, make your systems stronger by attacking them, e.g. Netflix simian army. When stuff crashes, does it not spread, how can we recover, can people still watch videos?